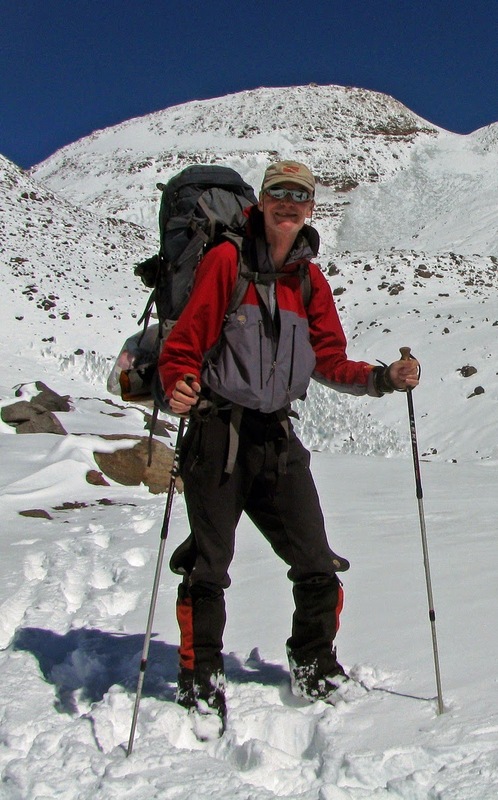 This is part 24 of a 31-part posting of my journal entries and photos from one of the greatest experiences of my life so far--a month-long mountain climbing trip to the Atacama Desert area of northern Chile and Argentina, which included summiting three 6000 meter peaks (~20,000 feet). To view all the entries in this series, check the posts labeled South America. As our early morning start time for a summit attempt on 22,615' Ojos del Salado approached, this happened. Suddenly we were more worried about survival than about climbing a mountain. Overnight the skies opened up. We got about a foot of snow. At 1:30AM, thankfully, it was beginning to let up. I spent 20 minutes clearing all the snow away from our tent. At 3AM Damian came over to say that the snow was too deep for a summit attempt and that we needed to pack up and try to get back to base camp instead, to which Phinella and I heartily agreed. If we got much more snow, even going down would become a problem. We were potentially in a life threatening situation. It was only after those decisions were made, and with the sky actually clearing that I got a little sleep. The day dawned sunny with the clouds left in the east wispy and far away. I bundled up and went out at 7:45 and found it breezy and 13 or 14 degrees F, but the wind quickly abated. It turned into a nice, although a cold morning. I went back to my tent and caught up on my journal, then at 8:20 we had breakfast and started packing up. 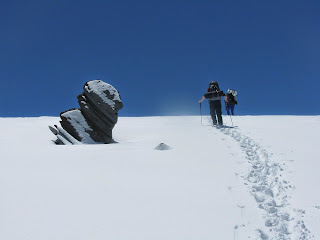 We were on the trail back to base camp by 10:30. The shot below shows our distant base camp, which is out of sight below the low straight ridge line. The high mountain behind that low ridge, right at the edge of the photo, is 6028 meter (19,777 foot) Volcan del Viento, which we would climb tomorrow, and the high mountain on the left side of the photo is Medusa. Here’s a nice shot showing the snow depth that also has artistic value, followed by a shot of me smiling (but unhappy on the inside because I was denied a chance to attempt the big summit). The traveling wasn’t too hard with Damian breaking the trail the whole way. It took only four hours to get back to base camp. 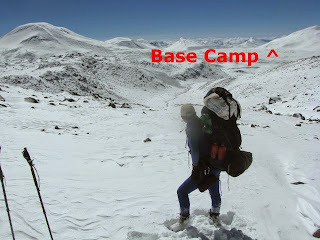 The reunion with those at base camp was fun. Brian was feeling much better and nobody had gone much of anywhere due to the snow that was as deep at base camp as at our high camp. With the help of those who had been resting all day, we set up our tents as we visited. I’m tenting again with Phinella at her suggestion, while Thom, who came down with stomach cramps at lunchtime on today’s trek home, got his own tent. For a couple of hours, his stomach problems really slowed Thom down, but thankfully he was much better by evening. Eventually I settled in and napped/rested to 5PM, then got some water at the glacier-base outlet/spring. I started catching up with my journal but was interrupted by an early supper of corned beef and mashed potatoes from dehydrated potatoes. Both tasted really good. The final course was not served (dessert) before thunder, dark clouds, and an east wind rolled in around 6:05PM. I retreated to my tent as snow grains began falling mixed with snowflakes. 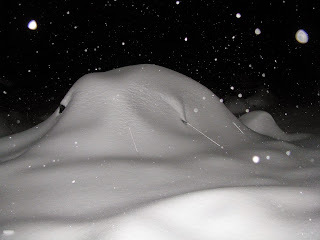 I finished catching up on journaling and then settled into the sleeping bag to rest and listen to the familiar sound of the snow pelting the tent. Fortunately the snow ended before sunset with only an inch of accumulation. I went out just for a bathroom break at 8:20 then read in my tent until my hands got too cold, then I went to bed at about 9PM.